Who says you need to spend a ton of money to show the triathlete in your life your love and support? While triathlon gear can certainly be expensive, this guide is all about smaller (but no less important) items that won't break the bank. 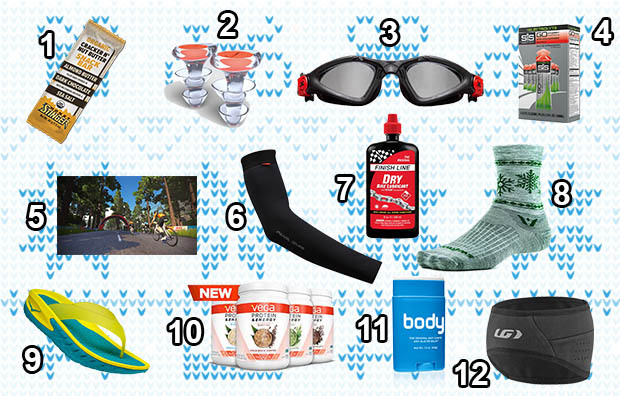 From goggles and chain lube to snack bars and protein powders, these under-$50 stocking stuffers are guaranteed to please even the pickiest of triathletes. Known for its popular energy waffles and chews, Honey Stinger released new snack bars formulated to fuel anything from a hard training session to a long afternoon at the office. Break up the monotony of sweet, fruity nutrition products with these savory on-the-go alternatives. Available in three different flavors, we are particularly fond of the almond butter/dark chocolate variety. Like hair ties, ear plugs seem to inconveniently disappear on a regular basis, and it's likely your triathlete will need a replacement pair sooner rather than later. New for 2019, these soft rubber ear plugs from Nike are the perfect stocking stuffer. They feature flared ends and a double flange design that molds to the ear to provide a tight seal against leaking. Triathletes can never have too many pairs of goggles. Designed by wetsuit brand Xterra, the Velocity goggles come in three different tints (clear, smoke & blue) optimized for different light conditions. The one-piece hydrodynamic micro-frame and ergonomic shape help the goggles stay sealed and comfortable no matter the distance. Designed for triathletes, the 180-degree field of view and hydrophobic coated lenses provide excellent optics for both long training efforts and fast race days. Used by Team Sky in the Tour de France, Science in Sport (SiS) creates clean, balanced and optimized gels and bars for endurance athletes. The new GO Energy + Electrolyte gel is packed with 22 grams of carbs, 118 milligrams of sodium, 9.5 milligrams of potassium and 1.5 milligrams of magnesium. Not only do they taste good, but they're also gentle on the digestive system. Popular with both age-groupers and elite professionals, Zwift has exploded into the triathlon scene with its virtual reality training software that pairs with most stationary trainers and sensors. Simply create an avatar, connect your devices and test your skills against cyclists across the globe. Available as a monthly subscription service, any triathlete would appreciate a few months of fitness in their virtual stocking. Triathletes spend an inordinate about of time in the sun while training and racing. If your triathlete isn't a fan of sunscreen (who is? ), these sun sleeves from Pearl Izumi are a great alternative. The In-R-Cool technology keeps your skin dry and cool, and the slip-on fit makes putting them on hassle free. The ELITE Transfer fabric has a UPF 50+ sun protection rating, and they keep a UPF 30 sun protection rating even when stretched by 30 percent. Say goodbye to cringeworthy chain squeak. Finish Line's DRY Lube with Teflon is a go-to versatile lubrication option for triathletes. The added Teflon™ fluoropolymer reduces friction between moving parts, ultimately increasing efficiency and decreasing wear and tear on expensive components. Available in a variety of sizes, the 8-oz. squeeze bottle option is the perfect size for at-home use while still small enough to pack for race weekend. Nothing says "holidays" like these festive Vision Five Snowflake socks from Swiftwick. Made from natural Merino wool, these socks wick moisture and will keep your triathlete warm during chilly winter runs and rides. The medium weight strikes a good balance between performance and comfort, and the seamless toe reduces rubbing. The last thing your triathlete wants on his or her feet after a hard brick workout is another pair of running shoes. The Ora Recovery Flip from popular running shoe brand HOKA One One features a plush yet supportive underfoot feel perfect for post-workout relief. Throw a pair in your triathlete's car or in their swim bag for convenient, slip-on comfort. Available in four tasty flavors (Cold Brew Coffee, Matcha Latte, Vanilla Bean & Classic Chocolate), Protein & Energy from Vega takes your triathlete's favorite protein supplement and adds 100 milligrams of caffeine from organic coffee for a mid-day pick-me-up. The protein is derived from plant-based ingredients and is vegan certified—it's ethical, delicious and healthy to boot. It may sound silly, but chaffed skin can make or break your race experience. Body Glide is the go-to anti-chafe solution for repetitive rubbing from a wetsuit, tri suit or between your thighs. It's dry and non-greasy, and one application lasts even for the full duration of iron-distance races. Conveniently sized and easy to apply, don't let your triathlete leave the house on race day without a stick or two. Designed specifically for cyclists and triathletes, Louis Garneau's Wind Headband is a no-frills solution for blustery days on the bike. It fits nicely under a helmet and is comfortable as a standalone option on a chilly run. The cozy material keeps your ears and forehead warm while excess heat can escape from the top of your head. A California native, Michael Nystrom graduated from the University of Southern California with a master's degree in journalism. He is a 2x IRONMAN and has done countless sprint- and olympic-distance triathlons. Follow Michael on Twitter, Instagram or LinkedIn.